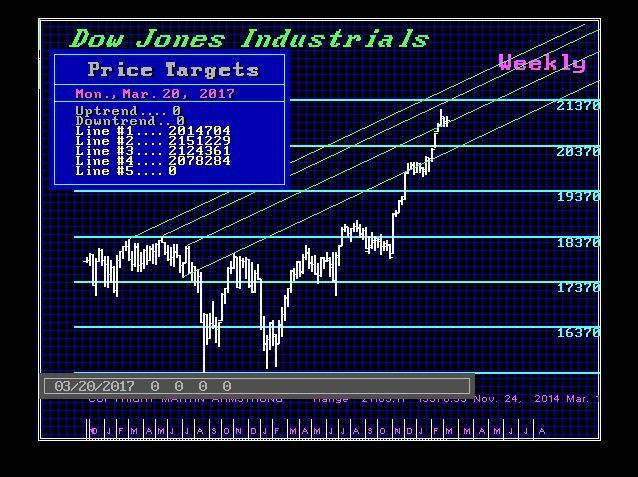 Today a closing above 20775 will signal that the Dow Jones Industrials is still holding firm. We see this period into May as consolidation. We have technical support at 20147 level and technical closing support at 20702. ONLY a weekly closing below 20000 would confirm a more sustainable correction into May. Otherwise, expect choppiness. The bulk of analysis still calls for a crash. This has been the biggest rally in history with the biggest amount of bearishness perhaps ever in history. We can see this week in a turning point and we should begin to see more volatility ahead. But you can see a choppy trend over other week for right now. A closing today above 20640 will also signal the market is still withing support. If gold closes March below 1243, this will warn that a correction into May is possible. This has been merely a 3 month reaction so there is still nothing to write home about just yet. Today, gold MUST close above 1245.50 to hold on to any gains. The Euro has a Weekly Bullish Reversal at 10855. Only a closing above that level will signal strength. Otherwise, caution is still advisable. Our monthly timing models called for a bounce here into March. The next important turning point will be May.